Is Invisalign in Las Cruces or Braces Right for You? No matter how much you’ve tried to improve the way you feel about your smile, you still don’t like it. There are not enough whitening strips in the world to make you love the way that your teeth sit on top of one another rather than in a straight row. That’s right—those crooked teeth are still affecting your self-esteem. Luckily, Invisalign in La Cruces offers a better, more modern way to straighten teeth without compromising your aesthetics like traditional orthodontics. But that’s not all—there are many other benefits to this innovative orthodontic treatment. Continue reading to learn more. Rather than traditional orthodontic treatments that require a plethora of metal brackets and wires, the Invisalign straightening system utilizes a series of smooth, clear plastic aligners instead. These aligners are used to guide your teeth into their correct places. These custom clear aligners apply slight pressure with each tray as you move along with your treatment. What are the Benefits of Invisalign Compared to Traditional Orthodontics? Less dental visits compared to the frequent tightening appointments you would be required to have with braces. The ability to enjoy the foods you want and love because the trays are removable! Easier dental hygiene care at home compared to traditional braces, again because your trays are completely removable. Less irritation and discomfort than orthodontic treatments that could lead metal brackets are wires to damage your soft tissues. 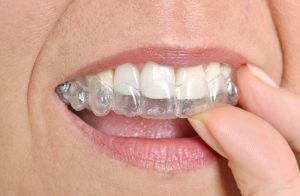 If Invisalign Is Right for Me, How Do I Get It? To begin the Invisalign process, you must first meet with your dentist for a consultation. This initial appointment will give your dentist the chance to evaluate your mouth, discuss your goals, and develop a treatment plan that’s personalized for you. It’s also a great way to have all of your questions and concerns addressed before you begin. Then, your dentist will have your custom impressions sent to an Invisalign lab to have your customized aligners crafted just for you. Within a short amount of time, you’ll get your aligners and start your treatment by wearing your first tray! It’s that simple. If you’re interested in learning about how you personally can benefit from the Invisalign treatment, feel free to call our local office to schedule your consultation. Here at Harbor Painted Skies Dental, we want to help patients achieve a better smile with the utmost comfort and convenience. Invisalign is one of the best ways to do that without compromising your overall look or comfort in your mouth. Contact us today to begin. Comments Off on Is Invisalign in Las Cruces or Braces Right for You?